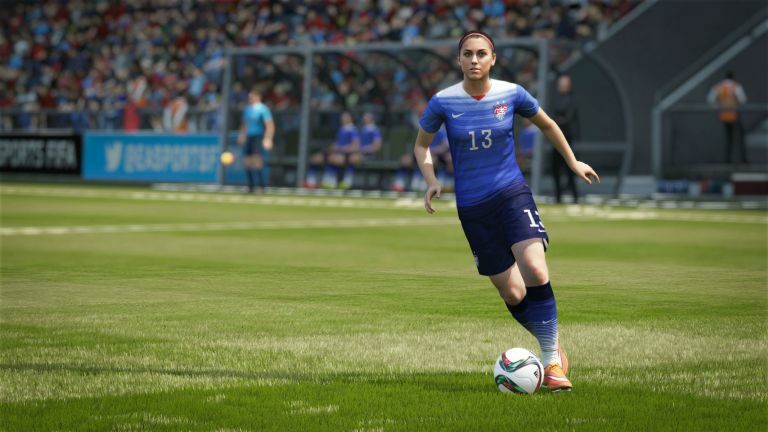 “We are better than this"
The boss of EA Sports has hit out at those who criticised the announcement that women would feature in their upcoming FIFA 16 game. You may not know it, but there's actually two FIFA scandals going on at the moment. One is a tale of corruption and bribery, and the other is about a video game. Somehow, they have equal critics. There was a barrage of sexist responses on social media to the announcement that women's football would feature in FIFA 16; a landmark for the long-running series, which started back in 1993. Peter Moore, chief operating officer at EA, took to Twitter to challenge the critics. He wrote: "So sad to see the misogynistic vitriol following the FIFA 16 announcement regarding women in the game. We are better than this." Many others also hit back at those against the move, one saying: "Don't be hard on men complaining about women in FIFA 16. They are just scared because they've never scored with a woman." Another said: "There are men complaining about women's teams finally being included in FIFA 16 and not complaining about the actual FIFA corruption scandal." FIFA 16 will feature 12 women's national teams that can compete against each other in Match Day, offline tournament and online friendly matches, including: Germany, USA, France, Sweden, England, Brazil, Canada, Australia, Spain, China, Italy and Mexico. Two things to note though; male teams will not be able to play female teams, and there will be no female equivalent of Ultimate Team mode. Still, this marks one of the biggest changes EA has made in years to the FIFA game franchise, we're excited to see what else the new instalment brings. FIFA 16 will be released on PS4 and Xbox One in September. Check out the new trailer below.